Gold Coast Suns list manager Craig Cameron says exciting times are ahead for the club’s northern academies following Caleb Graham’s selection in the 2018 AFL draft. The Cairns Saints junior officially starts life as an AFL footballer this week as he tackles his first preseason with the senior Suns list. 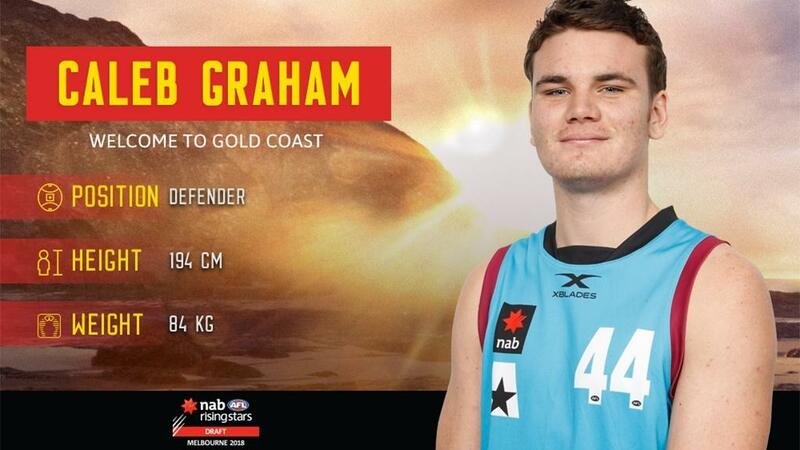 Speaking after the draft, Cameron is looking forward to seeing a settled Graham in 2019 and beyond after he was thrown around the ground in 2018, which helped him slide to pick 71 with the Suns. “He has had two years of really strong footy in our academy,” Cameron said. “This year he got thrown around a fair bit, he played key forward, back and in the ruck. Graham is now the fourth AFL Cairns junior on the Suns senior list in season 2019. The Far North teen began playing football in Cairns at the age of five and spent time with the North Cairns Tigers and Cairns Saints before joining the Suns academy in 2016. He also won two straight QAFL premierships with Palm Beach Currumbin.